Use external scenario file. 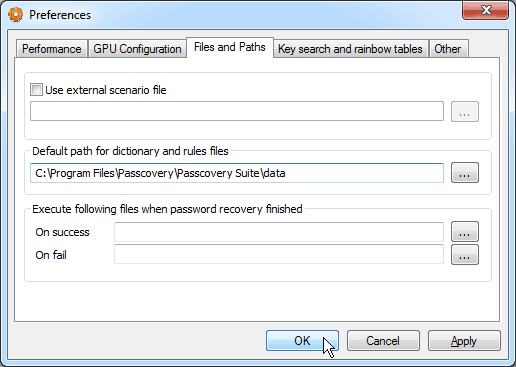 You can define your own scenario file and use it for automatic password recovery. Scenario files format is documented at here. Default path for dictionaries and sets of rules. Indicates the location of dictionaries and rules on the hard drive. Default folder - "/data"- installation folder of the program. If dictionary or rules file was not specified with full path then program will search for files at this path. Execute following files when password recovery finished. Note that you can use files with any extensions not just "executable" ones. Program using ShellExecute() Win32 API call, so any registered extension will be properly handled by Windows.